3M(TM) VHB(TM) Heavy Duty Mounting Tape 5952 is a black, 0.75 inch x 15 ft. 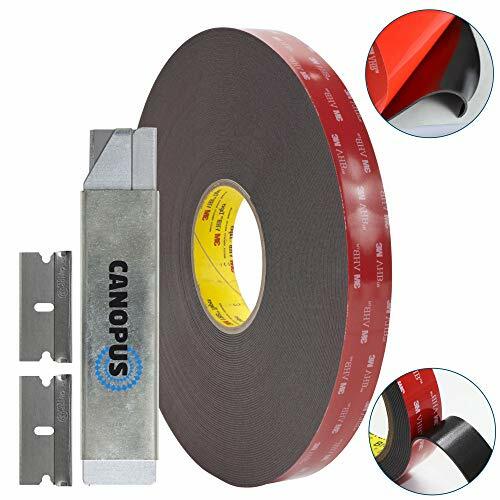 These double sided heavy duty mounting tapes eliminate drilling, grinding, refinishing, screwing, welding and associated clean-up. Dustproof and airproof of the glass curtain wall and assembly. Virtually invisible fastening keeps surfaces smooth. This product includes full metal one box cutter and two razor replacements. The 3M VHB Acrylic Foam Tape can not only replaces Rivets, Spot Welds, Liquid Adhesives and other permanent fasteners but also provides convenience and simplicity for use many interior and exterior bonding application. These adhesive foam tapes are viscoelastic in nature which gives the foam energy absorbing and stress relaxing features. If you have any questions about this product by Canopus, contact us by completing and submitting the form below. If you are looking for a specif part number, please include it with your message.